There is nothing more satisfying than creating something new from an old jumper discovered in a charity shop. I was initially attracted to the pretty shade of pink, but it was far too big for me. It was back in the Autumn when the nights were drawing in – when my thoughts turn to cosiness, wooden blankets and log fires that I decided to upcycle this unloved jumper into a cushion to feather my winter nest. 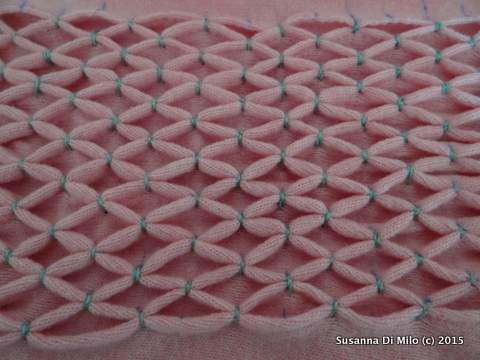 I have not seen smocking for a long time, but the idea for this front panel came when I was flipping through some old sewing books – the smocking method was lengthy and (to my mind) laborious. I thought it would be fun to play around with the technique to make it a little simpler as well as make the most of the texture of the jumper. 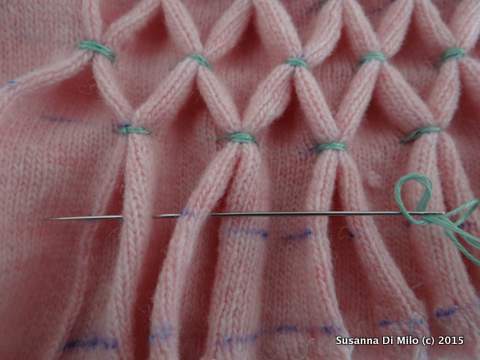 I started by using the front piece of the jumper for the smocking panel. I wanted to create a deep raised pattern so I made 1cm pleats across the panel. Then I marked across at 2cm intervals along the folds using a washable pen. 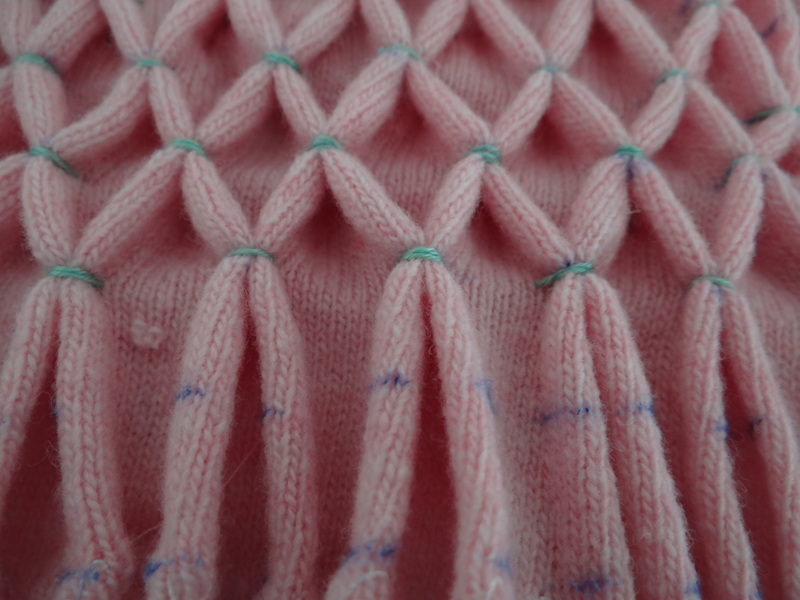 The pleating and marks made it very simple to create a honeycomb pattern across the jumper panel. I would alternate the pleat joins so that it ended up with regular diamonds. 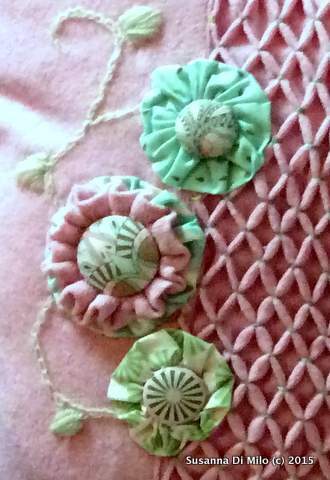 I liked the pale green Perle cotton – the shade was in harmony with the pink. As with all things hand sewn, it was such a relaxing panel to do that I often wonder why I don’t do more embroidery. Watching TV with my fabric on my lap, tea within reach the panel was done in no time at all. Despite the sewing book instructions making it seem laborious, it was quickly and easily achieved and I loved the texture. 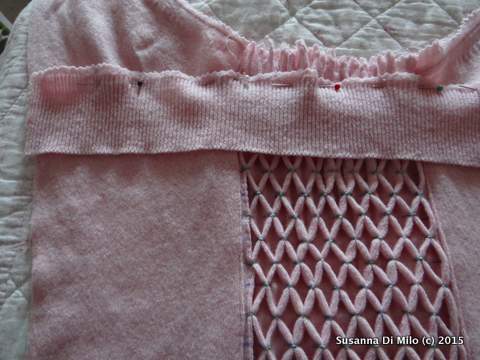 The smocking does reduce the width of the front section of the jumper by around a third so I used the sleeve sections either side to create a square panel. The ribbing at the bottom of the jumper created a nice frame bottom and top, so the front section was completed. I used the back of the jumper to make the back and stitched it loosely closed. If the cushion needed to be washed it would only take minutes to unpick. 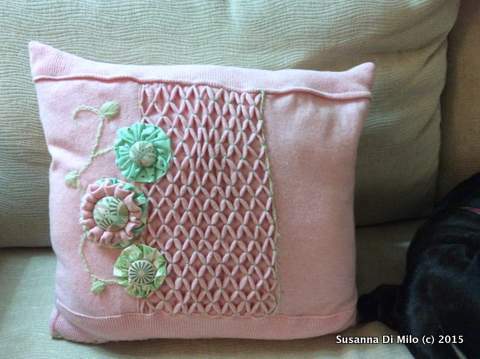 I also did not want zips or buttons to interfere with the softness of the cushion. 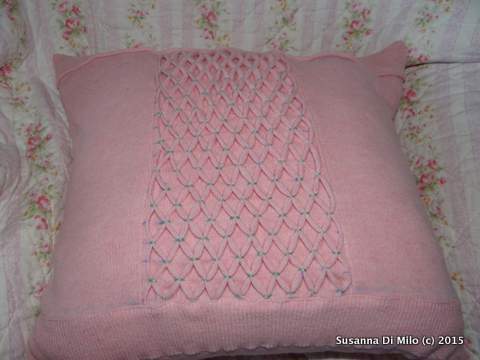 I felt the cushion needed a little more decoration so I made a few suffolk puffs (or yo yo’s as our American Cousins Call them) and utilised the ribbing off one of the sleeves. I also embroidered leaves and stems with wool. (Also pre-loved). 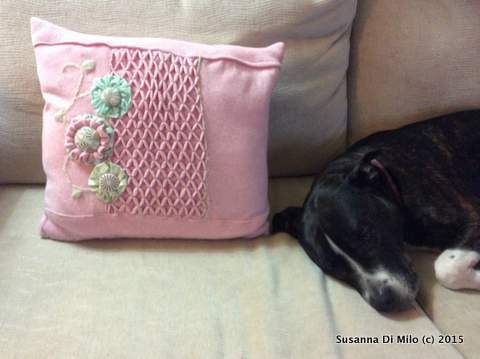 I am rather thrilled with the finished cushion, its so lovely to sit against (or lie next to as my dog prefers). It is quite easy to work with knits, just a case of selecting a straight stitch with a little zig zag in it and a ball point needle.